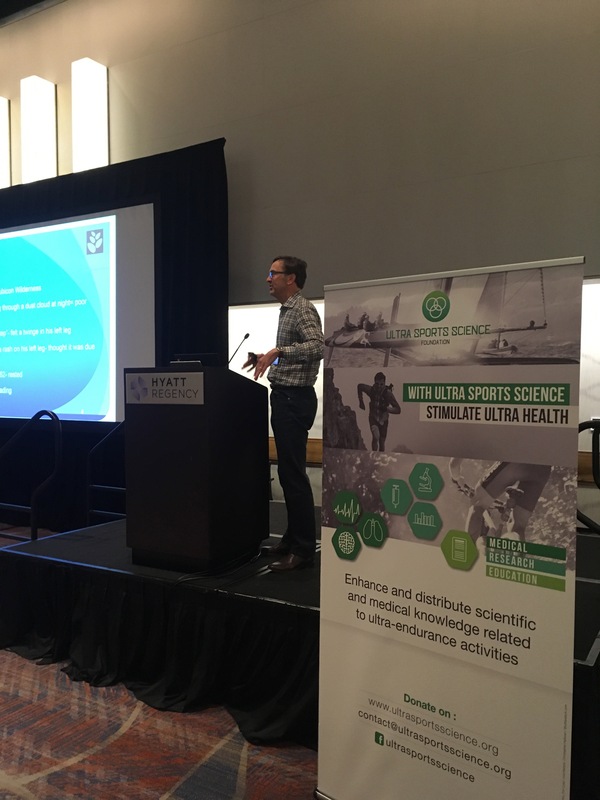 On May 30, 2017, I had the pleasure of attending the Fourth Annual Congress of the Ultra Sports Science Foundation in Denver, Colorado. The Ultra Sports Science Foundation was founded by three incredible docs: t theDr. Marty Hoffman, previous research director for the Western States 100, Dr. Volker Scheer medical director for the Al Andalus Ultimate Trail race as well as the assistant sports medical director at the University of Paderborn, Germany and Dr. Patrick Basset, an anesthesiologist, mountain rescue doctor and medical director for the International Paris Marathon, UTMB and stages of the the Tour de France. This is my third time at the conference (I unfortunately missed last year in Chamonix, France – still kicking myself!). This one-day conference is packed with incredible information from physicians and researchers throughout the world. I was fortunate enough to present a couple of case reports: one on a local runner and another with Carol Lindsey from the Castle Peak 100K (so the DPMR premier race has now been presented to an international scientific meeting!). Over the next few months I’d like to share some of the highlights of the lectures and what I’ve learned at the meeting. We’ll start with the first two presentations today. Does sodium prevent muscle cramps? Does sodium prevent exercise-associated hyponatremia? To make a long story short: Current research does not show that sodium supplementation prevented any of these issues, so there is no need to take salt caps. She also presented a few anecdotal cases of runners who got into medical problems after pushing too much salt (over 7000mg). While these were just case reports, the idea that too much salt can cause problems is concerning. Her bottom line is simple: If you’re thirsty: drink. If you’re craving salt: eat something salty. As an aside, the one concern I’ve always had with salt tabs is that you don’t taste the salt. There is a thought (not completely scientifically proven) that sensation of tasting salt is as important as the salt itself. In full disclosure, the folks at Easy Street aid station saw me try some salt tabs when I got cramps during the Broken Arrow. I’m not convinced they did anything! The second talk was from Trent Stellingwerff, PhD from the Canadian Sport Institute Pacific, who is also a very active endurance athlete. His talk was entitled “Fueling for Optimal Ultra Performance: from high carb to keto-adaptation.” Dr. Stellingwerff reviewed much of the data dating back to the 1925 Boston Marathon on the importance of carbohydrate intake with endurance exercise. In the 1970s and 80s, a number of studies from Dr. Edward Coyle show that carbohydrate ingestion did increase the amount of time that it took to fatigue. Over the past few years there’s been much more of an emphasis on trying to burn fat more effectively during exercise. The rationale is that if athletes are able to burn more fat, they may not need as much carbohydrate intake during the race and may not have as many GI issues, a common reason people don’t complete races. A few important points I learned: to truly become ketogenic, most people had to ingest less than 50 g of carbohydrate per day for at least three weeks. Also the data on ketogenic diets improving performance are very mixed, in part, because the definition of “performance improvement” varies so much between studies. Finally, Dr. Stellingwerff did point out our bodies are more efficient producing energy from carbohydrates than from fat oxidation. Finally, he pointed to the diets of some elite athletes: Kenyan marathoners get anywhere from 67-77% of their calories from carbohydrate. The famed Greek ultrarunner Yiannis Kouros, during a five-day race from Sydney to Melbourne, was able to ingest 11,000 calories a day and 95% of those calories were from carbohydrates including baklava, creamy custard and honey cookies. His bottom line was that ultimately every person is different and we all need to experiment. Some of these differences are probably dependent on your muscle fiber type. Parts of this are also likely based on your ability to digest carbohydrates during exercise which is incredibly variable from person-to-person. Finally, for people doing races where they are going to be exercising at higher intensities, carbohydrates are still likely the go to. One of the exciting things is that because participation in ultra endurance events has been a fairly recent phenomenon, the research is also new and is constantly changing. Thank you for reading and stay tuned for more updates!